Lancashire paid tribute to the men who died on the first day of the Battle of the Somme exactly 100 years ago. July 1, 1916, was a dark day in British military history - and for Lancashire as a whole which lost a generation of brave young men. Towns throughout the county marked the occasion with services and ceremonies. 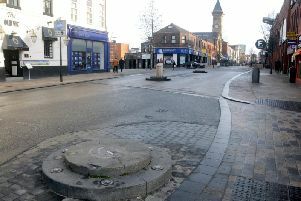 One of the most prominent was in Chorley where the Chorley Remembers project, in association with other local organisations, is holding a series of commemorative events. This morning, a Freedom of the Borough March and Astley Park War Memorial dedication was held from 11.15am. The 3 Med Regiment RAMC marched through Chorley town centre, followed by dedication of the Astley Park war memorial. On Thursday, a vigil was held at the Chorley Pals Memorial, Union Street, Chorley from 9.45pm to 10pm, led by the town’s MP Lindsay Hoyle. Yesterday, a service and Act of Remembrance took place at the memorial at 7.15am. A Honour Guard from the Royal Army Medical Corps attended, along with troops from the regional and local army reserve. A formal service was conducted by Rev Tim Wilby, of St George’s Church, Chorley. The Last Post was played at around 7.28am and a whistle sounded at 7.30am by the town hall clock for a two minute’s silence, followed by the reading out of the names of the Chorley Pals who were killed on July 1, 1916. Reveille was then sounded followed by wreath laying by the mayor, Mr Hoyle, Chorley Pals Memorial trustee, relatives of Chorley Pals, the leader of Chorley Council, 3 Med Regt. RAMC, cadets and other uniformed organisations, the Chorley in The Great War Group and local high schools. The Battle of the Somme film was shown at 7.30pm at Chorley Little Theatre. This evening, a Pals on Parade concert will take place at Chorley Town Hall at 8pm. Leyland Band will playing a variety of World War One music. This event is a joint effort by Chorley Council and South Ribble Borough Council, organised by Chorley Remembers. Tomorrow, Pals in the Park takes place from 11am to 4.30pm in Astley Park, Chorley. A major family event in both the park and Astley Hall, it will feature military displays, bands, dance, World War One re-enactors, a World War One field hospital and a troop of horses from the Lancashire Hussars in World War One dress, plus food of the era and other related displays and stands. The event is being organised and funded by the Chorley Pals Memorial Trust. Elsewhere, a service was held at the South Ribble memorial, Lostock Hall, yesterday. Warton village hall, Lytham Road, Warton, is holding a day of activities today to mark the start of the battle. It will include a children’s 1916 dress parade and an exhibition of wartime and 1916 life going on all day. There will be 1916-style refreshments served. A church service followed by wreath laying will take place at Garstang War Memorial, St Thomas’s Church, Garstang, tomorrow, at 6.30pm. See next week’s papers for more pictures.